Municipalities across the country are realizing that protection of water resources deserves an increased priority and focus. The cost and consequences of contamination as a result of a mischievous child, a vagrant wandering onto the property, or a terrorist looking to inflict maximum harm can be catastrophic. The typical chain-link fence with razor wire is nothing more than a simple physical barrier most 12-year-olds can easily defeat. • be adaptable, given that perimeters vary from site to site. • have a false/nuisance alarm rate as close to zero as possible. The cost of responding to false and nuisance alarms can quickly reduce the benefit of having an intrusion detection system. • present an imposing message to would-be intruders, yet be aesthetically pleasing to the surrounding environment. • communicate exactly where a perimeter breach is taking place. • be easy to maintain and be easily repaired, if needed. 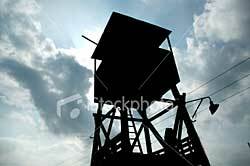 A guard tower system can help meet perimeter protection challenges. The system consists of a vertical sensing post attached to a wire array. The sensing post can be mounted at various heights and to various supporting surfaces. Each sensing post has a unique address location. When activated, the alarming post sends a signal to the head-end control, identifying itself and the breach location. The sensing post monitors the movement of the wires in the wire array—any significant movement of the wire in any direction activates the alarm sensors. In addition to the guard tower systems’ ability to be configured many different ways, the head-end controls also offer different options, depending on user requirements and budget. A computer-based control reads the information transmitted from the sensing post. Based on user inputs, the control will trigger an alarm condition, a relay-based standard alarm panel annunciates alarms either to an alarm panel with LCD keypad, or interfaces with an existing access control system, and a computer-based control with plug-and-play CCTV integration directs cameras to target the breach point, providing immediate visual verification. A well site in the middle of a residential area recently was threatened by vandalism. The intruders were breaching a 3-foot, wrought-iron fence mounted on top of a 6-foot-high brick wall. The user chose to install a 3-foot guard tower system using the relay-based control head-end integrated with an existing SCADA (supervisory control and data acquisition) control. The guard tower was mounted behind the existing wrought-iron fence and was selected because it: • offers close to zero false/nuisance alarm rate, • aesthetically fits with the environment, • has the ability to mount to both a sliding and swing gate, • integrates with the existing SCADA controls and • is certified to withstand a saltwater-spray environment. “Most fences are just hardened physical security— they don’t have intrusion detection capabilities,” said a municipality utilities manager using the system. “Our intent was never to keep intruders out; rather we want to know that they are trying to get in. We have major concerns about vandalism. With the intrusion detection capabilities of the guard tower system, we know something is going on and, more importantly, precisely where it is happening. At another site—a large water treatment facility—located in a harsh environment where snow and below-zero temperatures caused problems for previous perimeter protection systems, an 8-foot-tall standalone guard tower system with sensor posts spaced at 40-foot increments behind an existing chain link fence was chosen. An unsupervised public park adjacent to the site would attract people who would breach the perimeter on a regular basis. The guard tower intrusion detection system was selected because it solved such problems as minimal or no false/nuisance alarms in an ice and snow environment, the ability to pinpoint breach attempts, and because it was aesthetically pleasing and fit the environment. It also was found to be cost effective, and the head-end control networks plugged into the existing LAN (local area network). This article first appeared in an April 2007 supplement of Security Products, an 1105Media Inc., publication.